Wood You Like To See Mary? 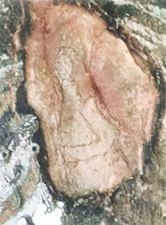 When an image of the Virgin Mary appeared on a Palo Blanco tree in their yard on October 29, the Rivas family of San Diego knew they wanted to share their miracle with others. Beginning this Saturday, December 12, the public is invited to visit the image between the hours of 2:30 pm and 4:30 pm. According to the Nueces County Record Star, the Rivas family lives on County Road 334 Buena Vista in San Diego, TX. Don’t be late. Or early. The timing couldn’t have been any better. 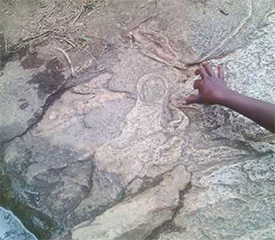 Less than month before Pope Francis will be visiting the country, and right in the middle of the celebration of the Holy Rosary which occurs every October, people living in Makueni County, Kenya have discovered an image of the Virgin Mary on a rock at Manooni Dam. She appeas to be holding Baby Jesus , has a dove by her shoulder, and a lamb resides nearby. News of the sighting has traveled quickly, with reports saying thousands of people have come to visit the site from around the area. While the Pope’s 3-day visit to Kenya has been planned for a long time, hopefully he has some flexibility and a free day in which to go to Makueni. Orange You Glad You Painted? 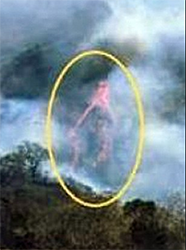 A forest fire in the San Sebastian region of Colombia had been burning for days, devastating over 600 acres and causing hundreds to become homeless, when a local priest noticed something in a photograph he’d taken of the fire – an image of the Virgin Mary. Villagers also see the image and are convinced that the photo taken by Father Pito is a sign that their fortune is about to change. “This is good news for our area which is so dry in the summer, because the little virgin is going to illuminate us and she is going to help us get through this,” one man told a local TV station. 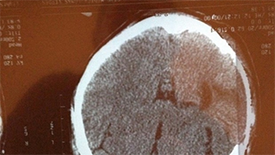 After returning home from a Mexico City hospital following emergency surgery for a stroke, Jennifer Lougee Mingramm and her husband Tamaha MacDonald were looking through a pile of X-rays that had been taken when they noticed something on an image of her brain – the image of Jesus Christ. Convinced it’s a sign of divine intervention that helped her heal, the couple has kept the X-ray handy at all times. Her family has even nicknamed it “Jen’s Jesus.” The couple, originally from New Zealand, is trying to raise money so she can go to the United States for a double lung transplant. 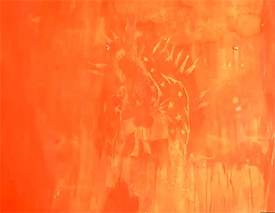 “The image represents a miracle,” MacDonald said, hoping it brings continued good luck. 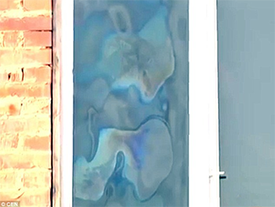 Soon after workers installed a window in a house they were building in the small western Ukraine village of Beregovoy, local people walking by noticed an image on the window which they thought looked like the Virgin Mary holding the baby Jesus. Not only that, but they say the house is warmer than other buildings in the neighborhood and “exudes a calm presence by spreading positive feelings.” Taking all this as a sign, many locals began praying to the window. Without publicly commenting on the phenomenon, church elders allowed the window to be taken from the house and put on display at the village church, where they hold special services each day, praying to the window. It never hurts to cover your, uh, vestments.